The right Facebook ad copy can have a dramatic affect on the performance of your ads! It can be the difference between successful Facebook ads and simply wasting money on marketing. This is something I’ve seen time and time again — with my ads management clients, ads coaching clients, and my students. That’s also what Brad Nelson discovered after taking my course, Flourish with Facebook Ads. 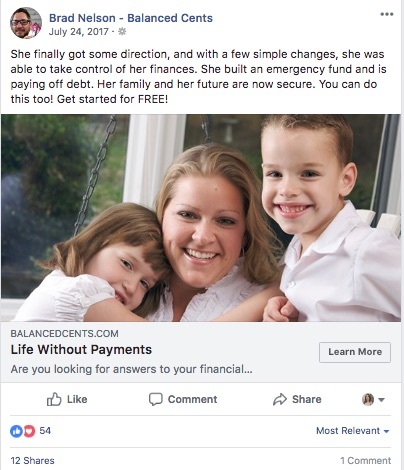 But before we get into specific examples, I want to give you a bit more background about how Brad uses Facebook ads in his business! Brad and his wife, Sarah, are like many other young couples. In the past, they were struggling with debt and money problems — until they decided to become debt free. After paying off all their debt in about 5 years, they discovered the positive impact that being debt free could have on their lives. 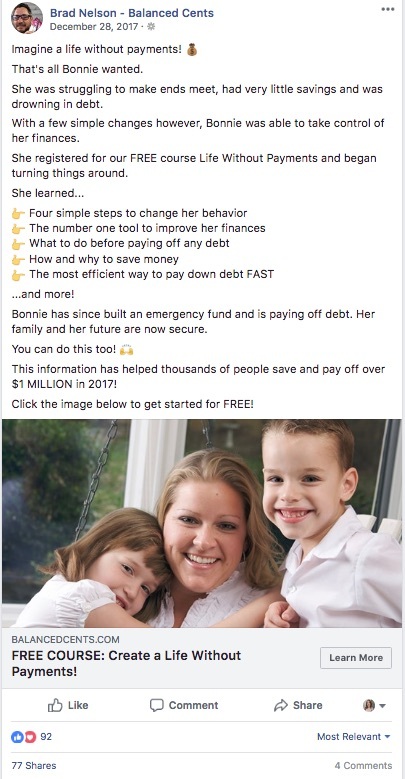 Being debt free allowed Brad and Sarah to achieve their dreams of owning and operating a business full-time from their home, while spending more time with their family. Brad’s business is centered around his blog, Balanced Cents, and his online membership program, Roots of Personal Finance. With his platforms he provides an eye-opening outlook on debt and money that challenges today’s popular that debt is a “normal” part of life. As part of Brad’s strategy to grow his blog and membership site, he uses Facebook ads to drive traffic and sales. 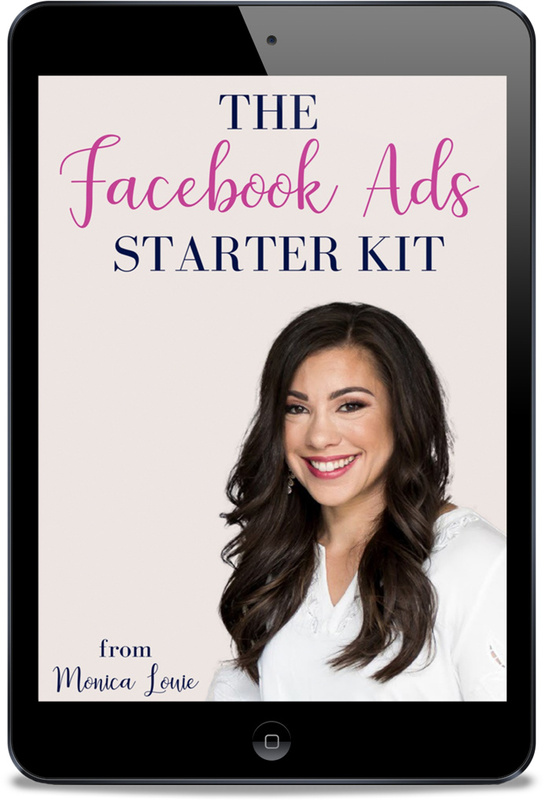 Facebook ads can be used for a variety of different purposes, including driving traffic to specific blog posts that are monetized with affiliate links, growing your email list for marketing purposes, and even product sales. “I see Facebook ads as being a critical tool in building my business,” Brad explains. With Facebook ads, Brad has seen his email list grow by 16%, while also growing his Facebook page by 26%. The best part is, he’s only been spending between $5 and $10 per day on his long-running ad for the past five months. In addition, Brad has seen increased signups for his free Facebook group! This is part of his funnel to get people interested in his paid membership site. The group was started in January 2018 and now has over 1,000 members, many of which he attributes to seeing his Facebook ads. In the beginning though, Brad’s Facebook ads weren’t always successful. His early attempts at running Facebook ads before taking Flourish did not achieve the results he wanted. But, after signing up for the course, Brad said his results are much-improved. In fact, within a few weeks he was able to get his cost per conversion cut in half! See the screenshot below that shows Brad’s average cost per conversion at just $3.42. And, after this screenshot was taken on December 31, 2017, Brad said his cost per conversion has dropped even lower. When asked about the most difficult part of Facebook ads, Brad said writing copy that converts was a struggle. The twice-monthly group coaching calls, including a hot seat opportunity to get feedback from myself, as well as other Flourish students, is an invaluable part of the monthly membership plan. Before the hot seat, Brad says his ad copy was more transaction-based with the copy focused on what was included in his free course. But, after revising his copy during the hot seat, Brad’s copy created a story that highlighted the benefits of course in a more compelling way. “We have met our goals of growing our audience with a very small amount of money. We are only going to improve from here and Monica’s insight and direction is the reason for that success,” Brad said. Brad’s biggest takeaway is the importance of understanding who your audience is when writing copy for your Facebook ads. What words do they use and how do they talk about their challenges? “Once you have all that information, put your avatar in a story. Show them you understand their challenges and show them you have a solution that will help them get what they want,” Brad explains. 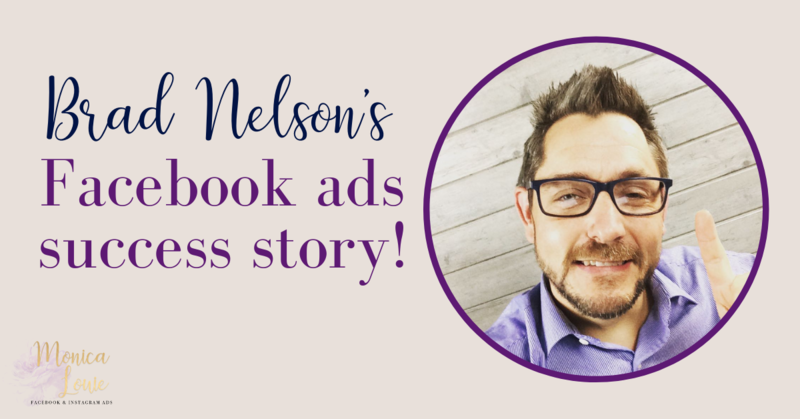 “Writing ad copy has been by far the biggest challenge in my business, but the more I practice it, the better I get, which gets better results with my Facebook ads,” he says.